Reasons why I don’t regret going to an HBCU although many people make it seem like I should. So I am writing this post for all you haters of HBCUs because it is Black History Month, and I wanted to share something about my experience that I don’t often talk about, outside of my school. 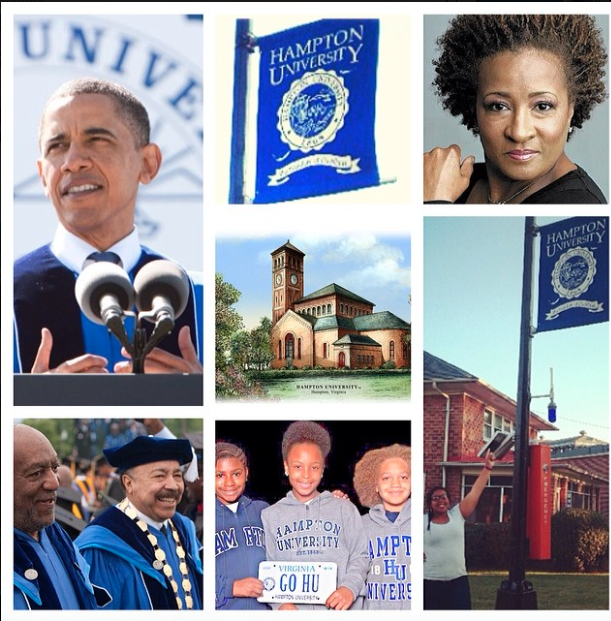 So I attend the illustrious Hampton University (HU), founded in 1868 in Hampton, Virginia. It started as an agricultural and trade school for the newly freed slaves, and has now developed into a world renown university. Hampton University is becoming more known for its research every year. We are one of the only HBCUs (Historically Black College/University) with a waterfront view, as well as a satellite in space! Anyways. I am getting off topic. So here some are the reasons why I don’t regret going to an HBCU. I am getting more than an education. I’m getting life lessons, and maturing in ways that I didn’t even know existed until going to the greatest HBCU of all time Hampton University (I’m a little biased). I’m sure you could get it at another small school, but it feels so much different. I feel like my teachers want to help me, not because it’s their job. They know what my interests are, and they really help me obtain my goals. One of the main things I loved, when I visited and what made me ultimately choose Hampton, was the family atmosphere. I always felt like I didn’t belong in high school, but here within in hours I felt like I belonged, and that this was home for me. I didn’t feel like I needed to wear my hair a certain way, or behave a certain way, because every one is so different, different is the norm! I would be lying if I didn’t say that Hampton has like a set sort of standard of how you are supposed to present yourself, however everyone adds their own flavor to it, to make it their own. Am I making sense? I’ve learned the beauty of only the strong survive. A lot of people transfer from Hampton University, because they believe it’s too strict or there are too many rules. I believe that the rules are there for our own good. They give all these rules as a guideline for adulthood. As a responsible adult, there’s no reason for you to be out all night on a Monday night, or drinking your life away. I believe that HU attempts to train us in a way that would be beneficial. Hampton I think makes things a little difficult for us to get accomplished, because in the real world nothing is going to come easy. Hampton isn’t just an education for now, but an education for life. So a lot of the rules and things you learn here, carry over into the real world. Opportunities and network. Honestly at Hampton they say this all the time, it’s not always what you know, but its WHO you know! I honestly wouldn’t have had all the opportunities I have without being at Hampton. My teachers put me in connections with people at Big name Universities like UNC Chapel Hill, Harvard, Stanford, Yale, Duke and many more. So when I do go to graduate school I know that I’ll be in good hands with the knowledge these professors have provided me, as well as the connections they have made on my behalf. People are always telling me, I don’t have any real world experiences because my school is all Black. One thing that my friends and I that attend HBCUs agree is that our schools spend a lot of time sharpening our skills to be in the real world. CONFIDENCE. I no longer feel a pinch of shame being Black. I know it sounds stupid, but when everyone and everything in your face is saying Black is not this, or Black people don’t behave in this way, it’s very hard to believe in yourself. I went to predominately white schools growing up, and only now at Hampton University, an HBCU, have I really learned who I am. I love being Black, and if that makes you uncomfortable, so be it. I was no longer “that Black girl who is quiet”, because everyone is Black, I’m now known as Tanesha, just a regular person like you. I needed to go to an HBCU to gain this type of confidence. It is Diverse. Now before you go, your school is mostly Black people, how could it possibly be diverse!? You know how Black people come in all different and beautiful shades of brown, that’s how our culture is. I meet people from throughout different regions of the United States, and international students, and no one acts the same. The African Diaspora is so vast and so beautiful to me, how could I not want to be around that? People who share somewhat of the same heritage as I do. I needed to be at an HBCU. HISTORY. It seems that Black History was taught in school in a sugar-coated, “I hope you’re not offended,” way that distorted the lens in which we view Black History. At an HBCU, we not only learn our history, but we live in it. On the campus of Hampton University, we have 5 historic landmarks on campus, in addition to Emancipation Oak, where the first reading of the Emancipation Proclamation was read in the South consequently freeing the slaves of the South, where Booker T. Washington walked and the halls he helped built and lived in are, where Rosa Parks worked after the Alabama Bus Boycotts, where educator and Civil Rights Leader, Septima Poinsette Clark graduated from, where students built our chapel and dorm on campus, where Wanda Sykes attended classes at, where where the FIRST African American mayor of Trenton, NJ attended, where Martin Luther King’s Mother, Alberta Williams King went to school. HBCUs are the grounds in which our people walked on, and set the foundation for us to even be able to succeed in the ways that we have, and are. History is literally the foundation of your experience at an HBCU and it wouldn’t make sense any other way. Something that most people don’t know about me is that I applied to 37 colleges, and was accepted into every single one. EVERY. SINGLE. ONE. That’s not to brag, it’s to show context. So I chose to go to a historically Black College, more importantly decided to attend Hampton University. I visited HU in my senior year of high school for a weekend, and fell in love, literally. By the end of that weekend I had my mind made up, and I didn’t care where else I got in at: I was going to Hampton University, and be apart of the HOTTEST Class of Quintessence. In essence, Hampton really chose me, and molded and matured me into the person I am today. If you want to chat it up with me, or have any comments please feel free to share! Also if you have any experiences you want to share, please do so!